Proxy Movies let you see the contents of a clip even when the full-quality version of that clip is offline. 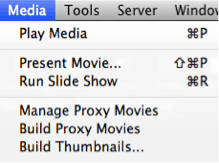 Proxy Movies are small enough to be kept around permanently long after you’ve finished editing a project. Giving you access to your footage with these low res files allows you to keep a permanent record of all your media on inexpensive storage. CatDV will automatically create and manage proxies from movie files that you import. You can choose the size and format of preview movies, which can be as small as 100 MB per hour, allowing you to easily keep your entire library online in preview form, even on a laptop. The CatDV Worker node allows for customisable background proxy generation allowing you to continue logging as the proxies are created. If you try to play or export a clip and the full-quality master copy is not currently available, CatDV will automatically substitute the appropriate proxy version. You can switch between proxy playback and full quality playback within the CatDV Clip Viewer. Proxy movies are referenced based on tape name and timecode. They can either be stored in a shared repository (so they are available to any catalog which refers to that tape), or they can be saved embedded with the catalog as a self-contained proxy archive (making it easy to move catalogs and their corresponding proxy files around, or Archive to LTO or DVD.